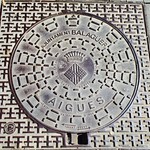 Balaguer (Catalan pronunciation: [bəɫəˈɣe], locally: [balaˈɣe]) is the capital of the comarca of Noguera, in the province of Lleida, Catalonia, Spain. 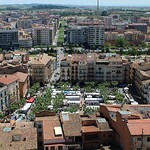 It is located by the river Segre, a tributary to the Ebre. The municipality includes an exclave to the east. 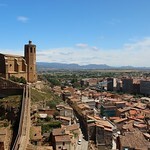 Balaguer was conquered from the Moors by Ermengol VI of Urgell in 1106; he made it his new capital, and it remained so for subsequent counts of Urgell. The town has a Gothic bridge, the "Pont de Sant Miquel", over the Segre river. This bridge was destroyed during the Spanish Civil War in the battle of "Cap de Pont" (bridgehead battle in 1938) and rebuilt after the war. Another Gothic building is the Santa Maria Church, in the heights above the city, in line with a quite finely conserved wall dating to the 15th century AD. The historic town is on the right bank of the Segre but, following the Spanish Civil War, construction began on a modern bridge, which initiated development of a modern extension of the town on the left bank. 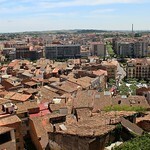 General Franco's forces first entered Catalonia from Aragon in 1938 through Balaguer's bridgehead.